So you want to know who the best French hip-hop band is? 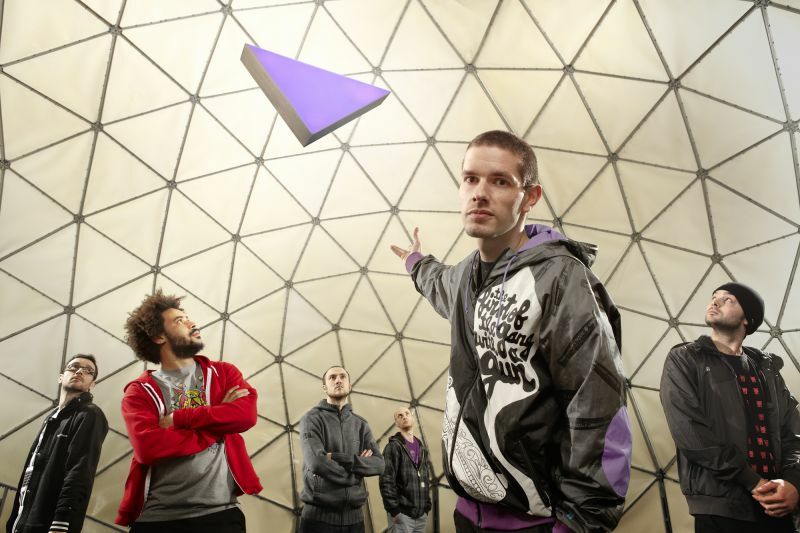 Then head on down to the Jazz Café in London on 9th April 2011, as Nantes-based hip-hop band Hocus Pocus will perform there. And we were lucky enough to get a sneak preview and interview with the gang! Formed in 1995 on Mc 20syl's initiative, Hocus Pocus has been a real commercial and critical success since 2005, when they released 73 Touches, a deliciously jazzy rap album with punchy lyrics. It's definitely been a while since such a good French rap album was made! As its name suggests (Hocus Pocus being a term for trickery or magic), the band is keen on performing unexpected musical sleights of hand, in which 20syl's rap flow is blended with acoustic, electronic and hip-hop elements. In other words, Hocus Pocus is a wonderful musical melting-pot in which a guitarist, a pianist, and a drummer perform alongside a DJ and an Mc. This originality goes some way to explaining how the band has seduced a wide range of fans – from acoustic jazzmen to spoken word lovers. The truth is that Hocus Pocus's style could not be further from our notion of mainstream rappers as trash talking chauvinists, who's skills do not seem to include musical composition, and who frequent overplay their bad boy roles. Hocus Pocus's members do not need to wear extravagant gold chains or perform alongside naked pin-ups in their music videos to be recognized, their only concern is the music. This is rare indeed in a kingdom ruled by Booba, Rohff and Sefyu (French rap stars). The band distanced itself from French gangsta rap and found its own style, which turned out to be unique. More recently, the band came back in 2010 with '16 Pièces', an eclectic album which featured British soul artist Alice Russell as well as French sensation Ben L'Oncle Soul, and legendary French rappers Akhenaton and Oxmo Puccino. Should you want to get better acquainted with Hocus Pocus, then you defintely have to listen this marvel of musical audacity named Beautiful Losers. After '73 touches', whose title referred to the piano's notes, after 'Place 54', alluding to the train in which you composed the album, what does the title '16 Pièces' mean ? Actually we were not looking for a homogeneous album with a unique guideline. Our main goal was to create good pieces without any central theme. That was just about enjoyment. This is why the album is entitled '16 Pièces" as it is the product of 16 moments which made us try to create great songs. 'To create great songs'. Can you be more precise ? In your opinion, what is a great song ? It is a piece we are proud of, something carrying a coherent message. We do not really focus on its radio-friendliness or its commercial effectiveness. Actually it is crucial to let our inspiration express itself freely. Do you mean you don't revise your lyrics ? Actually, to be honest, I really do my head in composing the lyrics. Each word, each idea is revised meticulously. Another ground for surprise in '16 Pièces" is the high number of featured artists: Alice Russell, Akhenaton, Ben L'Oncle Soul. Why did you decide to collaborate with them ? We were looking for artists who could contribute to the album with their own style, their personal universe. As we are passionate about all types of music, we wanted to collaborate with DJs, soul artists, rappers : the album is really varied. It was fantastic to perform with them, as that was a good way to try out new artistic ideas. Throughout the last decade, the style of the band has been changing a lot, from the pure rap of the late 1990's to the jazzy hip-hop of 2010's. How would you qualify this evolution ? Actually it has been really progressive. When we released our first two tapes, drums were much stronger in our songs. But as we experienced on stage performances we decided to be more spontaneous and then got closer to artists we really liked, as Jay Dee and De Angelo for example. As a consequence, we opted for a greater influence of hip-hop and instruments. As far as you are concerned, your flow has matured. Was this evolution natural, or did you train for it ? I just learnt to accept my own voice, without trying to imitate my teenager’s idols like Oxmo Puccino, NTM, Lunatic, IAM. Now my voice is much less contrived, more natural. As I found my own style, it has definitely enabled me to perform without artistic restraint. Surprisingly enough, your band has been defined as a sort of 'unidentified musical object' since you chose a jazzy style. Do you think it's a good description ? I do not really share this point of view because that would mean that instruments and hip-hop are incompatible. The problem is that it has long been a cliché that rap music is musically poor. I think it is due to the creation of rap music : when it was founded by artists like Kurtis Blow, the Mc was accompanied by a DJ only. There was no 'traditional' musicians on stage, so to speak. The least I can say is that it has been evolving in the wrong way, as some rappers opted for electro arrangements. I find it is really poor, and I am certainly not the only one to think that, as you can see that rap music is progressively distancing itself from electro. We are back to the 90's sound now. Do you suffer from the traditional image of a rapper ? Yes we do, definitely. For example, some radios are really reluctant to broadcast rap music, even if there is a lot of different types of rap music. But don't think that this has made us change our style. We have just evolved naturally to get closer to what is our deep musical personality : acoustic hip-hop. Surprisingly enough for a French group, you have had good success abroad. How do foreign fans perceive French hip-hop and your band more precisely? Actually they know IAM and Mc Solaar and that's all ! We performed a lot in Japan, where fans are real connoisseurs, in overcrowded concert halls with a great atmosphere : what more could we ask for? What is your feeling about English music and London ? This is the first time we perform in London, not counting our collaborations with talented English artists such as Omar and Alice Russel. I also love Gorillaz, they're a great source of inspiration with C2C. So it is fair to say I appreciate English music. Why you do not want to sing in English, as you said in your song 'Vocab' ? I tried to compose in this language, but my skills are really limited. I quickly had to use some clichés and preconceived ideas and I definitely hate that. French obviously comes much more easily to me. Another project for you is the reunion of the turntable group C2C (20syl's other band). Where have you got to so far ? Will you compete at the 2011 DMC World DJ Championships ? I do not think so. Do we still want to compete there ? We have already won the World Championships 4 times in a row, from 2003 to 2006, so I guess we need something else. But it is true our set could make us win it again. We will see. For more information about this gig at the Jazz Café on 9th April 2011, click here. Many thanks to JP, LP, AG for their suggestions.